The groom from a recent wedding can be seen here with a stream of beer dripping down his face as his friends tip the can while holding him up on the dance floor. The image took place inside a 5200 square foot dining hall overlooking Reflection Lake at Pocono Springs Camp in East Stroudsburg, PA. 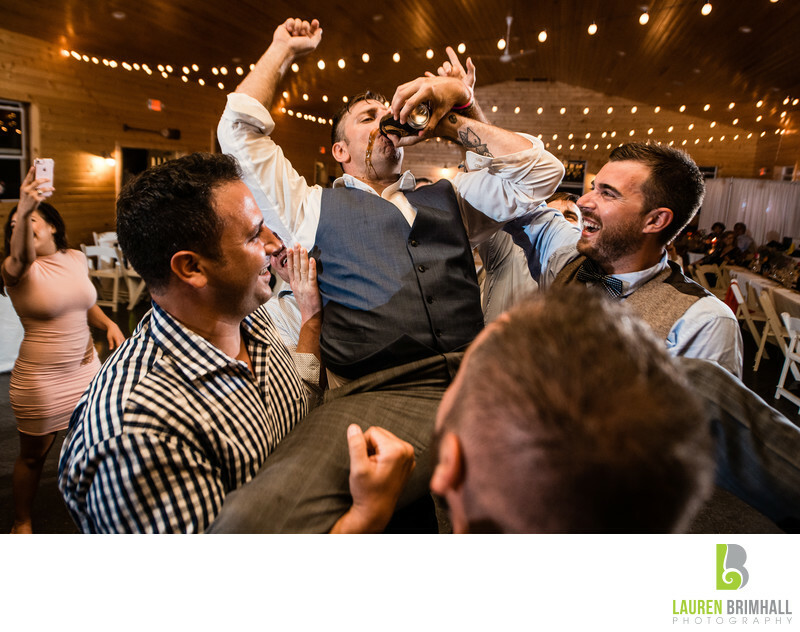 The grooms unkempt shirt and vest, rolled-up sleeves, and fist-pumping arm really depict the authenticity of this playful and spontaneous moment from his wedding. The excited expression on the faces of his friends, one of which appears to be a groomsmen, also contributes to the feeling of being at an amazingly fun reception party. The Christmas lights streaming through the background add a warm ambience to the image, bringing the couple right back to the memories of all the similar events that occurred there that night. This was the first of a two-part, two-band reception, the second half of which took place inside the venue’s 3000-square food Theater, complete with a stage that hosted dueling pianos at the rehearsal dinner the night before as well. This amazing couple was on the dance floor almost the entire night, enjoying their wedding to the fullest and this moment is the culmination of that fun.